At Mt. Harrison Audiology, our top priority is to provide the most advanced, compassion-driven hearing care to all our patients. That’s why we are proud to offer groundbreaking cochlear implant services to adults and children as young as 12 months old. We know that proper hearing is necessary for every aspect of life and that those with hearing loss are affected at home, at work, and in the community. There are times that hearing loss goes beyond the use of traditional treatment methods, and implantable hearing devices, like cochlear implants in Rupert, ID, can often help. A cochlear implant is a neuroprosthetic device that’s designed to drive the auditory system and provide significant improvements in hearing to those with severe hearing loss. With two primary components, the external sound processor and the surgically-placed implant that’s attached to an electrode and inserted into the cochlea of the ear, cochlear implants have been changing lives for over 40 years. For most patients, cochlear implants are a viable option when traditional hearing loss treatment options, like hearing aids, have been exhausted. 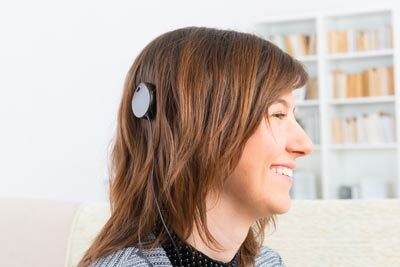 By offering direct stimulation to the auditory system, they provide users with enhanced auditory awareness and the ability to be a part of the conversation. After your complimentary consultation, our experienced team will perform an evaluation to see if you are a candidate for cochlear implants, then we will coordinate the implantation process with a highly skilled ear, nose, and throat surgeon. Once the implants have been placed, we will activate and ‘map” your device to ensure it’s customized to your specific needs, and also take care of any necessary follow-up servicing. Each patient can expect to undergo an adaptive process with several follow-up appointments for education, mapping, and to make the transition as simple as possible. Along with cochlear implant services, we will also be offering evaluations and fittings of audio osseointegrated (bone-anchored) hearing implants. These surgically-placed devices are designed for specific types of hearing loss in patients who do not experience sufficient hearing rehabilitation with hearing aids or cochlear implants. Our experienced team will perform a thorough evaluation to determine if you are a candidate for osseointegrated hearing implants and fit your device for treatment. We will then coordinate the implantation process with a highly skilled ear, nose, and throat surgeon, and we will take care of any necessary follow-up care. Contact our friendly office today for more information! If you think you or your child may be a candidate for cochlear implants in Rupert, ID, or if you want to learn more about this revolutionary treatment method, simply call 208.312.0957 or CLICK HERE to schedule your complimentary Mt. Harrison Audiology Communication Consultation. Your free appointment includes a review of your medical history, an in-depth discussion of your hearing loss concerns and goals, and an explanation of our process. After your consultation, our specialists will use our state-of-the-art diagnostic technologies to evaluate and determine your hearing loss and the impact it has on your cognitive function. We will work with you and your loved ones to determine the best treatment method for your hearing loss. At Mt. Harrison Audiology, you can count on receiving 5-star-rated care from our compassionate and experienced team every time you visit our office.